This application consists of seven sections and should take about 20 minutes to complete. Warning: Applications CANNOT be retrieved if closed! Please have a credit card ready to complete the last portion of this application. At least one emergency contact other than the mother or father must be given for new AND returning students. How did you hear about LAHHS? Does the student have any specific learning challenges? If so, please explain. Are there strategies about which our faculty should be aware that will help your child to succeed at LAHHS? If so, please explain them in detail. Does the student have any emotional or neurological issues of which we should be aware? If so, please explain. I hereby give permission to my child to participate in all LAHHS programs, activities and events and do release LAHHS and its representatives from all liability arising out of my child's participation in such activity. In addition, I, the undersigned parent/guardian of the above child, do further certify that my child is physically able to participate in such activity and hereby authorize LAHHS and its authorized representatives as agents for the undersigned, to consent to any x-ray examination, anesthetic, medical or surgical diagnosis or treatment and hospital care which is to be rendered under the general or specific supervision of any licensed physician (under the provision of the California Medicine Practice Act) or the staff of a licensed hospital, whether such diagnosis, examination or treatment is rendered at the office of said physician, or at such hospital. It is understood that this authorization is given in advance of any specific examination, diagnosis, treatment or hospital care being required, and is given to provide authority and power on the part of our above named agents to give specific consent to any and all such examinations, diagnosis, treatment or hospital care which the aforementioned physician in the exercise of his best judgment may deem advisable. The authorization is given pursuant to the provisions of Section 25.8 of the Civil Code of California. In addition, I give authorization for my child?s photograph or likeness to be utilized in LAHHS promotional materials. Please print this form, sign and date it, and return it to the LAHHS office via fax, mail, or E-mail as soon as possible. 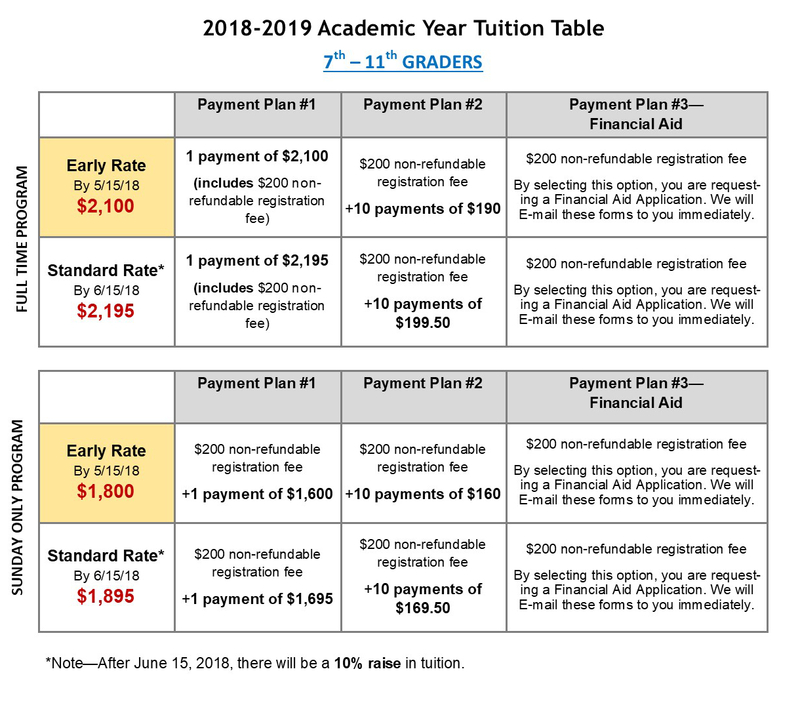 Use this tuition chart to choose a Payment Plan. A Sibling Scholarship is given to families who are enrolling more than one student. 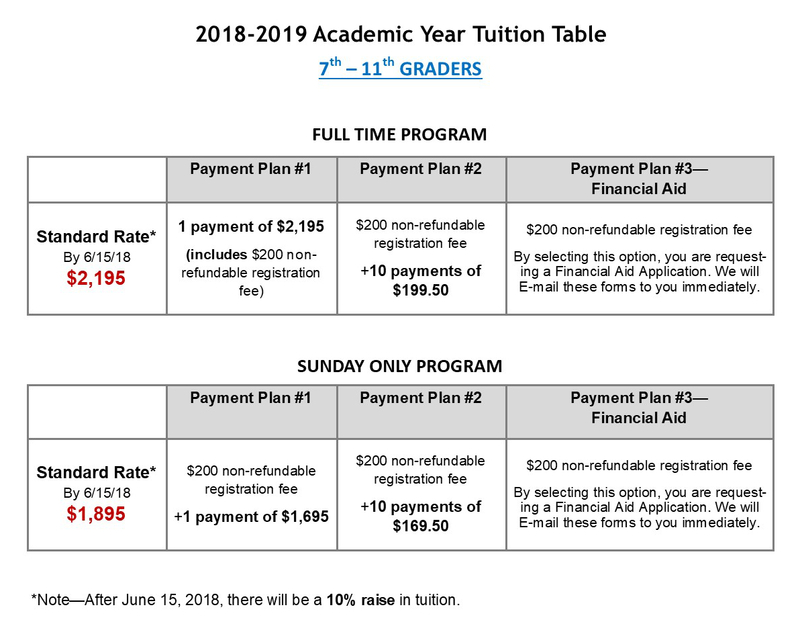 If this application is for a sibling of a registered student, please enter the "coupon" code: SIBL2 ($180 discount). If you will be registering a THIRD student, enter to code SIBL3 ($360 discount) when completing this section for that student's application. ONLY ONE DISCOUNT MAY BE APPLIED PER FAMILY. Los Angeles Hebrew High School offers optional Sunday bus service to students in various locations. Bus transit information will be sent to all families of registered students in a later E-mail. By signing below, I confirm I understand that I am responsible for the tuition payment selected and corresponding fees. Further, I understand that if I do not withdraw my student in writing by NOVEMBER 15, 2018, I will be responsible for all tuition fees for the year. If I do withdraw my student in writing by NOVEMBER 15, 2018, I understand that I will be charged a prorated tuition fee.